Although some other plant species have black seeds, their efficiency, to current knowledge, is not even close to the efficiency of the black-caraway seeds. It is one of the earliest cultivated plants in human history. The oldest documents about the medical application of black-caraway oil are dating back from the time of the pharaohs. Its health effects have been used mostly by healers such as Hippocrates or Avicenna, or the great civilizations such as the Greeks, the Romans and the Arabs, and it was also mentioned in many religious writings. Nowadays, the black-caraway is being re-discovered by modern science, and in the last 40 years there were 400 scientific studies published on the topic black-caraway and its active substances. Asthma, allergies, chronic fatigue, autoimmune diseases such as rheumatoid arthritis and psoriasis, elevated blood lipids, diabetes mellitus (diabetes), hemorrhoids, varicose veins, high blood pressure, bacterial, fungal and parasitic infection, headache, eczema, skin fungi, lichens, neurodermatitis, acne, bronchitis, cough, pneumonia, sinusitis, weakened immunity, joint and muscle pain, gastritis, stomach pains caused by “nervous stomach “,intestinal fungi (candida albicans), bloating, diarrhea, colic, liver disease, kidney stones, insomnia, depression, poor circulation, PMS, tumors … etc. The black-caraway oil has beneficial effects on the skin (feeds and nourishes the skin which helps in the regeneration of damaged cells).It also makes your nails brighter and stronger, strengthens hair roots and is effective against dandruff. The answer lies in the ideal chemical composition of its seeds, which contain more than 100 biologically-active substances that complementary and mutually reinforce the health effects which result in one type of functional synergism (increased action). These active substances include omega-3 unsaturated fatty acids, vitamins B1, B2 and B6, vitamin C, vitamin E, nigellon, nigellin, thymoquinone, saponin, beta-sitosterol, and many others. 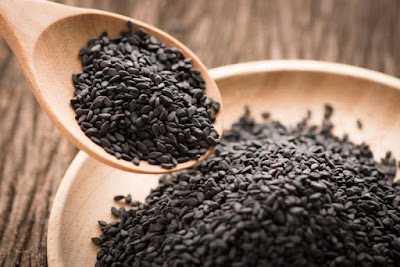 You should also take into account that black-caraway helps the body to restore the balance to the immune system, as well as ensuring smooth running of metabolic processes. For this reason, regular use of black-caraway oil is recommended not only in acute and chronic conditions, but also as a daily supplement. In this way you will be able to take a major step for your health and long-term vitality.